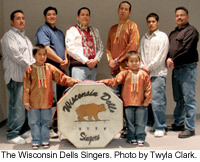 The Wisconsin Dells Singers was founded in 1976 by Ken Funmaker Sr. Today his son, Elliott, coordinates the group. Members include Funmaker brothers and cousins. Typically, four or more members sing in Ho Chunk to the steady beat of a large dance drum. In a presentation, the Wisconsin Dells Singers will sing and talk about the songs, drum and traditional clothing that are part of their performance.